“Such now is the place of the early twenty-first century U.S. with systemically generated polices accumulating toward self-inflicted Armageddon and threatening to take the rest of the world with it. In the same week that saw renewed war for oil in Iraq and Syria it was reported that the Obama administration is rebuilding the U.S. nuclear weapons arsenal. In this same week that saw the largest climate resolution demonstration in history a series of dim shills for empire, a/k/a ‘leaders,’ went before the United Nations to offer the statistics of misdirection, ten times more than, thirty percent less than, that in context confirm the truism that something times nothing is nothing […]. With his recent misdirection on renewed war against Iraq and Syria and climate crisis the precise question of whether or not U.S. President Barack Obama is the most cynical person who ever lived remains irrelevant. The social ontology that suggested difference, as well as the words of the man himself, back into his fact as President of American empire. His assertion that IS (Islamic State) and Khorasans represent a direct threat to Americans places it in the set of all direct threats to Americans that has around 300,000 thousand dying every year from preventable medical errors. Climate crisis poses greater risks than any Mr. Obama will ever factually address. And his duplicity in undermining climate ‘negotiations’ in 2010 and 2014 while publicly proclaiming support is now a matter of public record. Remarkably, or perhaps not so much, the Western commenting class is content with technocratic discourse on military tactics and ‘sectarian’ divisions in Iraq and Syria playing into the diversion that U.S. and ‘coalition’ actions have ‘political,’ as opposed to economic, basis. This isn’t to dismiss political consequences, but they are borne of economic motivations — the unifying theme between wars in the Middle East and climate crisis is oil. The U.S. is bombing oil fields ‘held’ by IS in Syria under the rationale that oil is the ‘currency’ it is funding itself with. Oil, munitions and credit default swaps are the currency the U.S. funds itself with. Matters that are ‘externally’ related like wars for economic resources and climate crisis risk confusing ‘the issues’ that respective ‘experts’ find unsatisfying in their combined dimension. But discursive silos make addressing joint causes of global catastrophe in imperial capitalism impossible. The true threat that IS poses is in exposing oil as the currency of empire. Oil ties to political power through its economic power and it ties to military power through its fact as fuel for the machinery of war. Climate chaos, along with a century or more of slaughter and destruction for oil, is the concentrated product of empire […]. 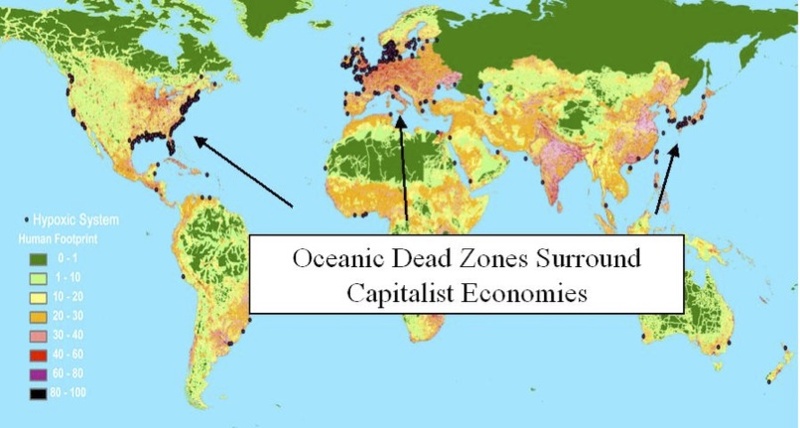 [T]he oceanic dead zones that surround capitalist economies are their own fact and metaphor for the Western creation of land-based dead zones through wars of conquest and slaughter for economic resources. Petroleum-based agricultural run-off and the dumping of massive quantities of consumer and industrial garbage create these oceanic dead zones. 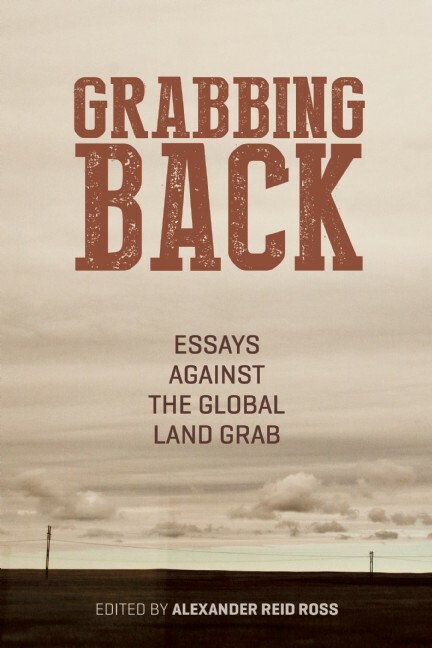 The misdirection of lip-service paid to greenhouse gas emissions while ignoring the other detritus of consumer and industrial ‘culture’ is to reframe global catastrophe as technocratic wrangling over ‘parts per million’ when the problem is political economy of death and destruction. Source: National Geographic. The American tendency of personalizing the political leads to permanent misdiagnosis of the genesis of Western political dysfunction. Attributing Barack Obama’s pro-war, pro-Wall Street, anti-environmental policies to the man himself is to get it backwards. These policies serve his constituency. This constituency — Wall Street, arms manufacturers and extractive industries, determine the policies. Mr. Obama has his job as President through his ability to keep his nominal constituency of liberals and progressives on board with policies of permanent war, use of state power to deliver ever more economic resources to the already wealthy and end-times environmental policies. So will the political mis-leadership that follows him no matter their political Party. What President Barack Obama’s actual policies have demonstrated — drone murders, surveillance and repression, persistent economic chicanery in favor of the already wealthy, war wherever the U.S. can find it and undermining all efforts at environmental reconciliation, is that the political space he occupies, the moderate center, is the true radical fringe when viewed through the lens of the continued existence of a ‘world’ that includes the rest of us. Rebuilding the largest nuclear arsenal in the world in 2014 is insane. There exists no conceivable explanation — bluff, taunt, economic stimulus, etc. that could frame the decision as the product of anything but a radically deranged system run amok, a genocide-suicide machine running on auto-pilot […]. If / when it comes, resolution in any of these dimensions will be brought about through acts against the corporatist moderates in Washington, London and Brussels, against Wall Street, the arms manufacturers and the extractive industries. Until these are gotten out of the way there is no hope for resolution. Divestment will not be effective — there are infinite sources of funding for industries that can turn guaranteed profits and even for those that can’t. Fracking is a financing and trading scam — the actual gas taken out of the ground doesn’t even pay for itself in the aggregate. Cap-and-trade requires a developed infrastructure of regulations; inspectors and global coordination that will never come into being because the economic interests being ‘regulated’ are the same ones developing these policies […]. The governments of the West are currently pulling out all of the stops to frighten people into supporting yet another war for oil resources in the Middle East. The threat of ‘terrorism’ is a cynical diversion and nothing more. Thirteen years after the attacks of September 11, 2001relevant portions of the investigation report laying blame on Saudi Arabia for the attacks remain redacted. Terrorism in the Middle East is state sponsored misdirection. True terror is having children that you cannot feed because bankers destroyed the economy. True terror is having fracking companies destroy your farm’s water supply and having no alternate source. True terror is having global warming raise sea levels to bury the island where you and everyone you know live. True terror is having a U.S. ‘humanitarian intervention’ bomb your village / town / city / country into the Stone Age to make way for a new pipeline. The American Empire is in the death throes of decline. The powers that be are increasingly desperate and this makes them increasingly dangerous. Fracking, nuclear weapons, bombing Afghan wedding parties and banker scams is all that this leadership knows how to do. Resolution within Western political economy is decades past possible. People can divert themselves with incremental reform but consider this: the ‘evolution, not revolution’ crowd now has about four decades of devolution to answer for. Nuclear weapons? In 2014? Really? Really?